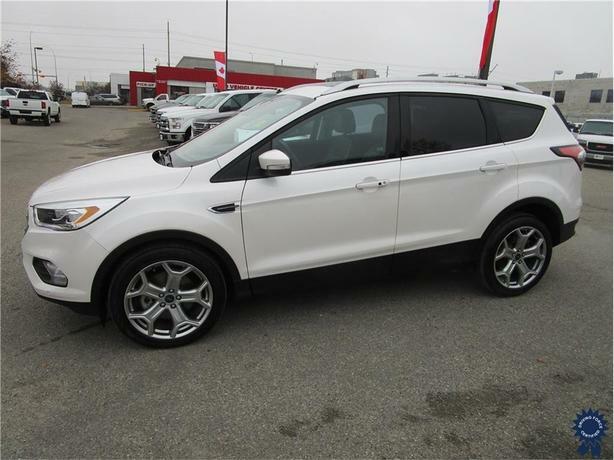 This 2017 Ford Escape Titanium 5 Passenger 4X4 SUV comes with a 6-speed automatic transmission with SelectShift, 3.07 axle ratio, white platinum metallic tri-coat exterior color, heated leather salerno front bucket seats, Canadian Touring Package, power panoramic vista roof, all-weather floor mats, roof rack rails, voice-activated navigation system with Sony audio system, WiFi hotspot, blind spot monitor, keyless start, power liftgate, backup camera, rear parking aid, Bluetooth, remote engine start, and GVWR rating of 4,840 lbs (2,195 kgs). The 2.0-litre Ecoboost GTDI I-4 gas engine provides 245 horsepower at 5,500 RPM and 275 lb-ft of torque at 3,000 RPM. Touch base with us to discuss purchasing or financing options that are right for you and experience the difference you will only find at DRIVING FORCE Vehicle Rentals, Sales and Leasing.